Is it possible to be Too Beautiful? 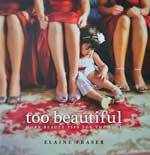 In this companion book to Beautiful: beauty tips for the soul, you will be inspired to develop qualities such as joy, peace, love, justice and mercy in your life and be someone who is Too Beautiful. In a media-driven world that idolises only the fleeting physical aspects of female beauty, it is good to be reminded of the character qualities that make us truly and endearingly beautiful. If we live out these qualities in our everyday lives, we will become extraordinary and continue the journey to fully living out our potential as a young woman. Every chapter has stories and beautiful photos, along with a section called SOAP. SOAP is a group of Scriptures to reflect upon with an Observation, Application and a simple Prayer.